Climate change is a global phenomenon, yet its impacts are more localized in vulnerable and poor regions. 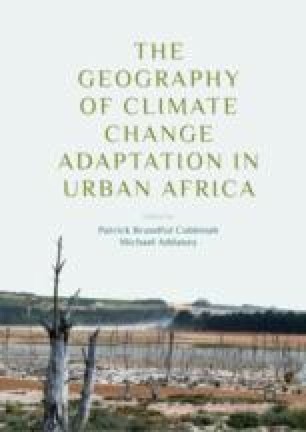 This chapter finds answers to how urban residents in a Ghanaian city of Tamale have been responding locally to the adverse effects of climate change. Four suburbs were studied using in-depth interviews, and focus group discussions for the data collection. Findings indicate that adaptation practices differ according to individual and household well-being, and largely governed by availability of information and resources. Similarly, reactive and unplanned nature of adaptation strategies used by households have deepened the existing unequal power relations and inequity in the communities. Bartlett, R., Bharati, L., Pant, D., Hosterman, H., & McCornick, P. (2010). Climate Change Impacts and Adaptation in Nepal (IWMI Working Paper 139). Colombo, Sri Lanka: International Water Management Institute, 35 pp. https://doi.org/10.5337/2010.227. Cutter, S. L., Emrich, C. T., Webb, J. J., & Morath, D. (2009). Social Vulnerability to Climate Variability Hazards: A Review of the Literature. Available at http://adapt.oxfamamerica.org/resources/Literature_review.pdf. Accessed 4 October 2011. Cutter, S. L., Solecki, W., Bragado, N., Carmin, J., Fragkias, M., Ruth, M., et al. (2014). Urban Systems, Infrastructure, and Vulnerability. In J. M. Melillo, Terese (T.C.) Richmond, & G. W. Yohe (Eds. ), Climate Change Impacts in the United States: The Third National Climate Assessment (pp. 282–296). Washington, DC: U.S. Global Change Research Program. https://doi.org/10.7930/j0f769gr. Institute of Development Studies (IDS). (2008). Disaster Risk Reduction and Climate Change Adaptation: Closing the Gap. Sussex University. http://www.preventionweb.net/files/7846_climatechange1.pdf. Mertz, O., Mbow, C., Nielsen, J. Ø., Maiga, A., Diallo, D., Reenberg, A., et al. (2010). Climate Factors Play a Limited Role for Past Adaptation Strategies in West Africa. Ecology and Society, 15(4), 25. http://www.ecologyandsociety.org/vol15/iss4/art25/. Nelson, G. C., Rosegrant, W. M., Palazzo, A., Gray, I., Ingersoll, C., Robertson, R., et al. (2010b). Food Security, Farming, and Climate Change to 2050: Scenarios, Results, Policy Options. Washington, DC: International Food Policy Research Institute. Available at http://www.ifpri.org/sites/default/files/publications/ib66.pdf/. Accessed 13 August 2013. Satterthwaite, D., Huq, S., Pelling, M., Reid, H., & Lankao, P. R. (2008). Adapting to Climate Change in Urban Areas: The Possibilities and Constraints in Low- and Middle-Income Nations. Human Settlements Group and the Climate Change Group at the International Institute for Environment and Development (IIED). Available at http://www.iied.org/HS/topics/accc.html. Tompkins, E. L., & Adger, W. N. (2004). Does Adaptive Management of Natural Resources Enhance Resilience to Climate Change? Ecology and Society, 9, 10. Available at http://www.ecologyandsocietyorg/vol9/iss2/art10.